Garden Patio Furniture Set 4/6 Seat Dining Set Parasol Glass Table And Chairs UK. Here We Have A Selection Of Kingfisher Outdoor Garden Patio Sets. They Are Available In 4 And 6 Seat Versions With A Little Colour Thrown In For Good Measure. This Patio Set Is An Essential piece Of Kit For Today's Modern Living And With More And More Of Us Spending Time In The Garden Whether It Be For Parties Or BBQs. These Furniture Sets Are Made From Tough Textoline Material For The Seats And The Table Top Is Made From Treated Glass. 6pc Black Garden Patio Dining Set Round Table With Parasol. Stylish black and silver design 1 x glass table 4 x folding textoline mesh chairs 1 x black garden parasol Table measures 80cm x 68cm high The chairs measure 53cm x 58cm x 76cm Polyester umbrella measures 180cm Set comes boxed Requires simple home assembly. 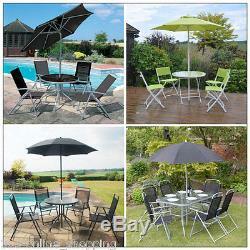 8pc Black Garden Patio Dining Set Rectangle Table With Parasol. Stylish black & silver design 1 x rectangular glass table 6 x folding textolene mesh chairs 1 x black garden parasol The table measures 70cm high x 70cm wide x 120cm long The chairs are 78cm high x 45cm x 49cm The parasol is 120cm wide Set comes boxed Requires simple home assembly. 6pc Deluxe Black Garden Patio Dining Set Round Table With Tilt & Crank Parasol. Stylish black and silver design 1 x glass table 4 x folding textoline mesh chairs 1 x black garden parasol. &###xA0; &###xA0;Tilt And Crank Parasol Table measures 90cm x 68cm high The chairs measure 53cm x 58cm x 76cm Polyester umbrella measures 180cm Set comes boxed Requires simple home assembly. 6pc Lime Green Garden Patio Dining Set Round Table With Parasol. 6 piece garden furniture set. 1 x table with toughened glass top. 1 x durable polyester parasol. 4 x chairs with textoline seats and backs. Easy to clean with a damp cloth. Chair size (cm): H78 x W46 x D53. Table size (cm): H71 x &###xD8;87. Parasol size (cm): H226 x &###xD8;197. Please read this policy completely before returning an item. However, a brief explanation will help us to improve the service we offer to customers in the future. Please do not return the item until you have heard from us. If you fail to return the goods, we will collect them, and we will charge you the direct cost of collection. &###xA0; The above policies do not affect your statutory rights. Please ensure that your return is made via an insured and tracked service in case of loss or damage in transit. All goods will be inspected on return. The goods are your responsibility until they reach our Warehouse. We guarantee that your issue will be solved quickly. We usually respond within 24 hours on weekdays. 6pc Black Garden Patio Dining Set Round Table With Parasol Stylish black and silver design 1 x glass table 4 x folding textoline mesh chairs 1 x black garden parasol Table measures 80cm x 68cm high The chairs measure 53cm x 58cm x 76cm Polyester umbrella measures 180cm Set comes boxed Requires simple home assembly 8pc Black Garden Patio Dining Set Rectangle Table With Parasol Stylish black & silver design 1 x rectangular glass table 6 x folding textolene mesh chairs 1 x black garden parasol The table measures 70cm high x 70cm wide x 120cm long The chairs are 78cm high x 45cm x 49cm The parasol is 120cm wide Set comes boxed Requires simple home assembly 6pc Deluxe Black Garden Patio Dining Set Round Table With Tilt & Crank Parasol Stylish black and silver design 1 x glass table 4 x folding textoline mesh chairs 1 x black garden parasol Tilt And Crank Parasol Table measures 90cm x 68cm high The chairs measure 53cm x 58cm x 76cm Polyester umbrella measures 180cm Set comes boxed Requires simple home assembly 6pc Lime Green Garden Patio Dining Set Round Table With Parasol ---6 piece garden furniture set ---Brand: Kingfisher Gardening ---1 x table with toughened glass top ---1 x durable polyester parasol ---4 x chairs with textoline seats and backs ---Rust-resistant white steel frames ---Foldable for simple storage ---Easy to clean with a damp cloth ---Chair size (cm): H78 x W46 x D53 ---Table size (cm): H71 x Ø87 ---Parasol size (cm): H226 x Ø197. The item "Garden Patio Furniture Set 4/6 Seat Dining Set Parasol Glass Table And Chairs UK" is in sale since Thursday, March 23, 2017. This item is in the category "Garden & Patio\Garden & Patio Furniture\Furniture Sets". The seller is "365-online_shopping" and is located in Bathgate. This item can be shipped to all countries in Europe.